Students ages 8-18 will showcase their work using their ability to analyze and to clearly communicate critical thinking using the tools and methods of systems thinking and system dynamics. Give students the experience of being coached on their projects by experts in the systems field, teachers, and other students, in a helpful and supportive manner. Permit teachers from different schools to see evidence of student work communicating critical thinking using systems thinking and system dynamics (ST/SD). Provide a venue for teachers and kids to network and learn from each other. DO STUDENTS NEED A LOT OF EXPERIENCE TO PARTICIPATE? No! DynamiQueST creates a venue for celebrating what has been done, informing those who wish to start, and providing encouragement for all! Student projects can be presented through posters, videos or other media of student choice. What to do about Avian Flu? Urban Development of Williston, Vermont: Impact on Local Vermont Indicator Species…And Many More! Teachers who have used ST/SD in their classrooms for years. WHAT ARE SYSTEMS THINKING AND SYSTEM DYNAMICS? The tools of ST/SD range from graphic organizers to computer models. The tools of systems thinking can help us comprehend complex issues and ideas. Analyzing and understanding change helps students form successful strategies for learning and working with the challenges they meet in the world. 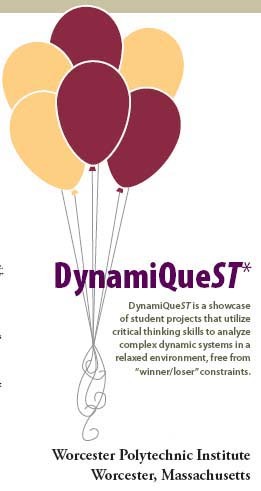 HOW DO I KNOW IF DYNAMIQUEST WILL FIT MY STUDENTS? So what? What should be done? Community members who are curious about better ways to help students learn about the complex systems that are everywhere. Identify project(s) about topics that change over time. Look at the Rubrics for Projects and Tips on Using System Dynamics Tools or email Lees Stuntz for a free copy of Communicating Critical Thinking: Visual Tools for Student Projects. Check Creative Learning Exchange for information or email the director, Lees Stuntz. If you are new to learning systems thinking get in touch with the CLE. We have both the resources and the willingness to help you get ready for DynamiQueST.